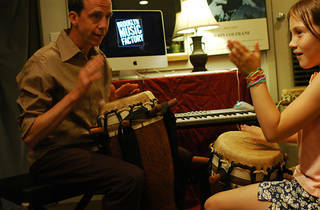 Kids amp up their talent at these music schools. 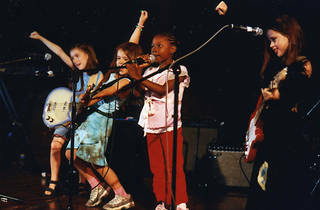 Children get a sense of what it takes to be a folk singer by learning an instrument (usually guitar), penning their own music and lyrics, recording in a studio and designing album artwork. 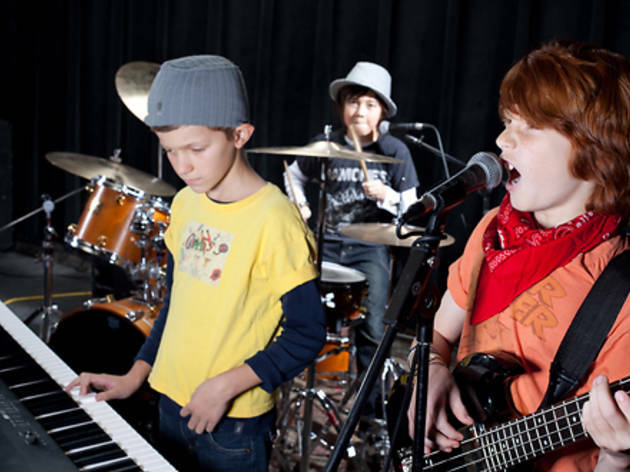 To give kids a taste of the real indie-music experience, classes culminate in a showcase performance at a live music venue. Multiple venues (917-608-2433, blueballoonschool.com). Ages 3 and up. See them perform: May 21 1--4pm. The Knitting Factory, 361 Metropolitan Ave at Havemeyer St, Williamsburg, Brooklyn. $15, children $5. Keith Richards wanna-bes start out by strumming along to their favorite rock tunes. 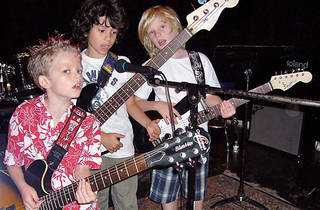 Then they work their way up to mastering more advanced techniques like riffs, licks and shreds. 81 Fourth Ave at St. Marks Pl, Prospect Heights, Brooklyn (718-855-5400, brooklynguitarschool.com). Ages 8 to 16. 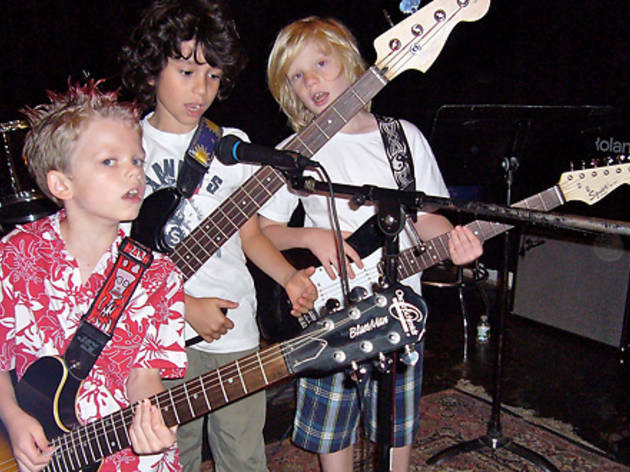 See them perform: May 13 at 7pm. See above for venue info. Free. 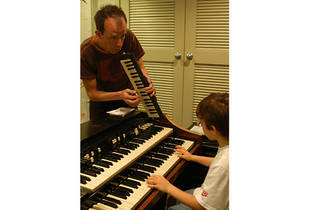 Aspiring musicians learn how to produce original songs while also playing the greats, from the Who to the White Stripes. 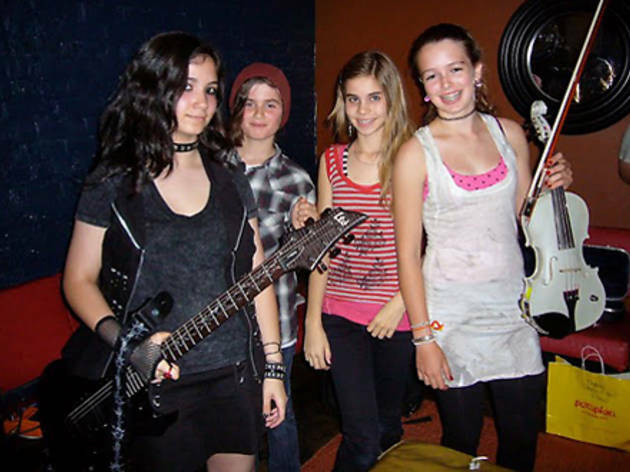 After rehearsing with their bands and hamming it up in photo shoots, youngsters live out their rock & roll dreams by performing at city venues like the Living Room. 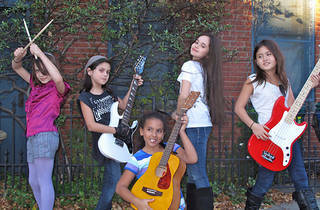 Complete Music Studio, 227 St. Marks Ave at Vanderbilt Ave, Prospect Heights, Brooklyn (brooklynkidsrock.com). Ages 7 to 14. See them perform: June 18 2:30--5pm. The Living Room, 154 Ludlow St between Rivington and Stanton Sts. $4, children $3. 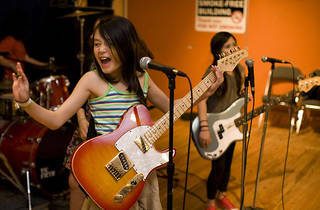 Students rehearse with their bands before performing gigs, but the Factory churns out more than just rock & rollers. 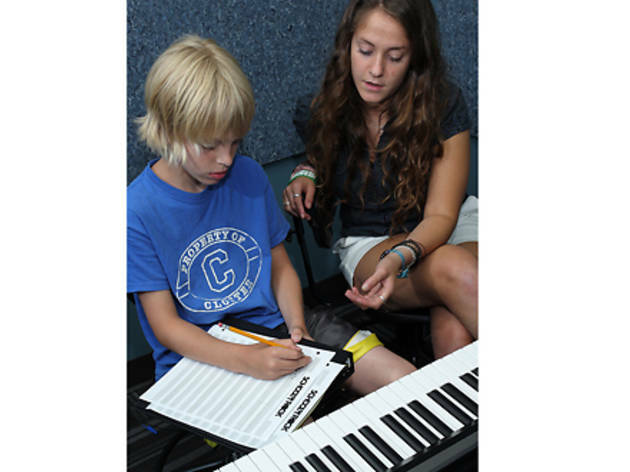 Soul, big band, girl-pop and country ensembles add variety to the program, and weeklong camps in June allow musicians to compose, perform and record their own songs in a real studio setting. 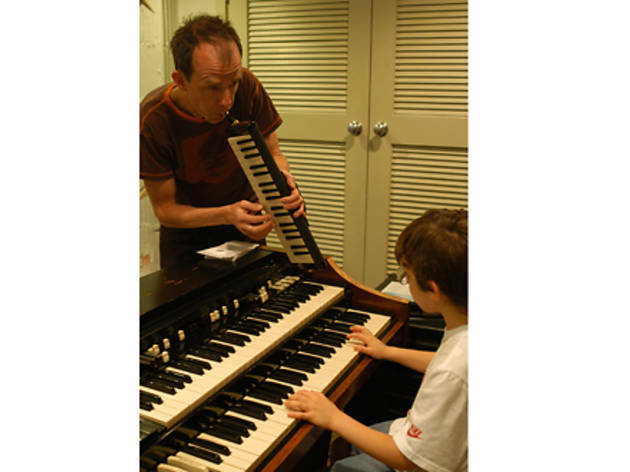 441 Warren St between Bond and Nevins Sts, Boerum Hill, Brooklyn (718-624-2267, brooklynmusicfactory.com). Ages 6 and up. See them perform: *May 8, May 22 at 5pm. Puppets Jazz Bar, 481 Fifth Ave between 11th and 12th Sts, Park Slope, Brooklyn. $5 suggested donation. *June 5 at 2pm. Littlefield, 622 Degraw St between Third and Fourth Aves, Gowanus, Brooklyn. Check website for pricing. *June 19 2--5pm. Gowanus Arts Building, 295 Douglass St between Third and Fourth Aves, Gowanus, Brooklyn. Free. Campers pick up rock skills from pro musicians while forming bands, composing original songs, and designing posters, T-shirts and CD covers for their groups. The weeklong summer camp culminates in a live show, and kids get to keep a souvenir recording of their performance. The Allen-Stevenson School, 132 E 78th St between Park and Lexington Aves (800-295-5956, dayjams.com). Ages 8 to 15. 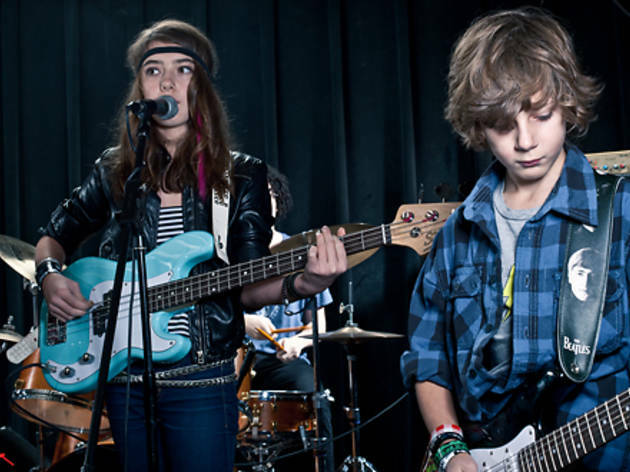 Young rockers form genre-based bands, memorize songs and refine their stage presence with an end-of-session public concert in mind. Complete Music Studio, 227 St. Marks Ave at Vanderbilt Ave, Prospect Heights, Brooklyn (917-573-2292, gowanusmusicclub.com). Ages 8 to 16. See them perform: *May 14 1--6pm. Riverwalk Commons, 455 Main St between Queensboro Bridge and Roosevelt Island Bridge, Roosevelt Island. Free. *July 16 1--4pm. Union Hall, 702 Union St at Fifth Ave, Park Slope, Brooklyn. $10, children 18 and under $5. 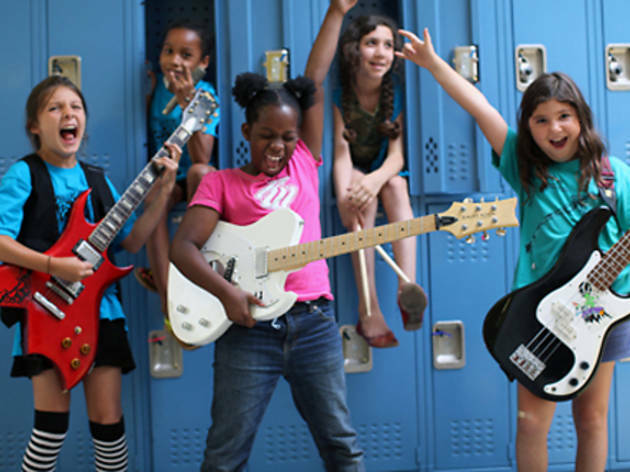 Fans of Guitar Hero learn how to play the real thing in the beginners' boot camp, which also teaches kids the basics of songwriting and performing. More advanced players form a band and compile a set list. 251 W 30th St between Seventh and Eighth Aves, 11th floor (646-485-7244, nycguitarschool.com). Ages 8 to 17. 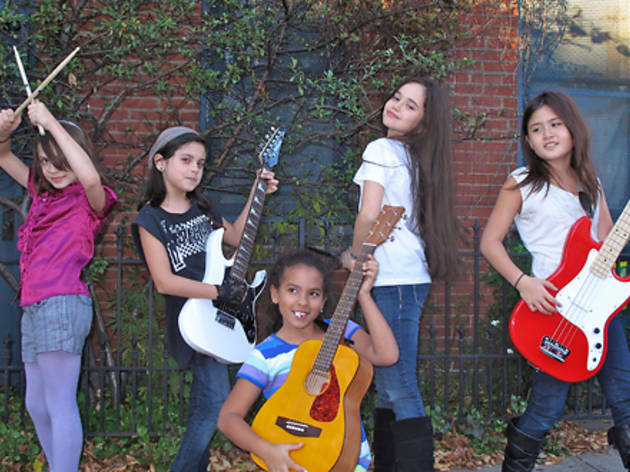 See them perform: May 1 4--6pm. Kenny's Castaways, 157 Bleecker St between Sullivan and Thompson Sts. Free. 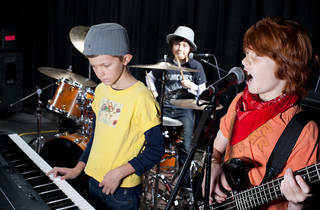 Performers of all skill levels and backgrounds focus on an instrument of their choice (guitar, drums, keyboard and more) in this mixed-genre day camp. 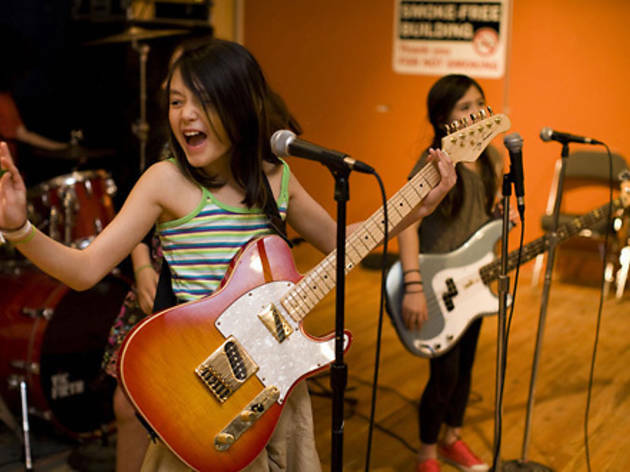 When they aren't rocking out, students deepen their appreciation of music in an empowerment workshop; topics range from recording and hip-hop to music photography and band promotion. * International High School, 883 Classon Ave between President and Union Sts, Prospect Heights, Brooklyn (212-810-9877, nycrockcamp.org). *Curtis High School, 105 Hamilton Ave between Daniel Low Terr and St. Marks Pl, Staten Island. Ages 10 to 17. 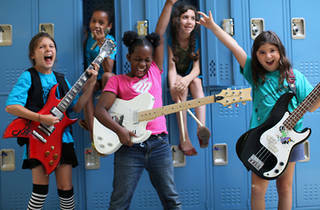 See them perform: *July 23 at 2pm,.The Knitting Factory, 361 Metropolitan Ave at Havemeyer St, Williamsburg, Brooklyn. $10, children 6 and under free. *Aug 13 at 6pm. Curtis High School; see above for venue info. $10, children ages 6 and under free. 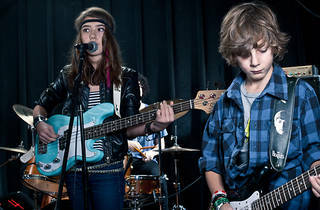 Tweens learn the ABC's of rock (think rhythm, chord progressions and instrument technique), as well as more-advanced subjects like improvisation and stage presence. 683 Union St between Fourth and Fifth Aves, Park Slope, Brooklyn (347-463-1669, psrockschool.com). Ages 8 to 16. "Smoke on the Water"? Check. "Stairway to Heaven"? Check. Incipient guitar stars nail the chords of their favorite tunes, then build technique until they're shredding like a pro. 32-18 Broadway at 33rd St, Astoria, Queens (718-626-8121, queensguitarschool.com). Ages 9 to 17. 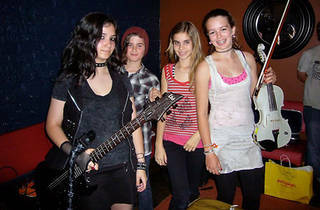 See them perform: May 14 at 7pm. See above for venue info. Free. 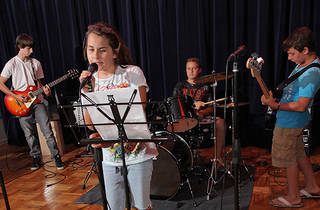 Much like the Jack Black movie of the same name (though with professional musicians, not fake substitute teachers), this program preps kids to perform in live rock shows by practicing with their bands and penning their own music and lyrics. 630 Ninth Ave between 44th and 45th Sts, suite 602 (917-438-9141, schoolofrock.com). Ages 7 to 18. See them perform: *May 8, 9 at 5pm. The Living Room, 154 Ludlow St between Rivington and Stanton Sts. $10. *May 14, 15; June 4, 5, 11, 12 at 5pm. Arlene's Grocery, 95 Stanton St between Ludlow and Orchard Sts. $10. 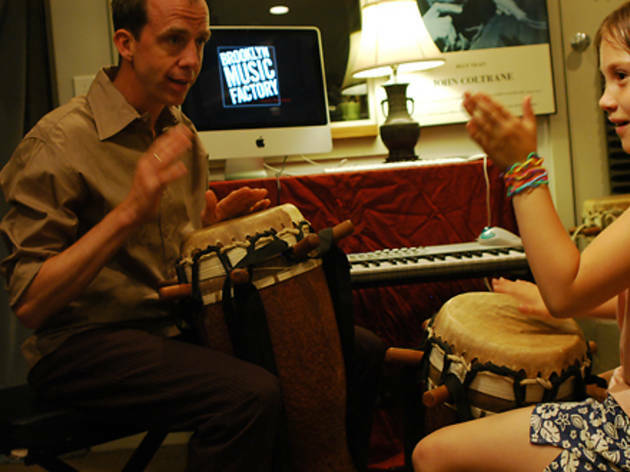 Instead of practicing teacher-selected music, budding superstars choose their own tunes. 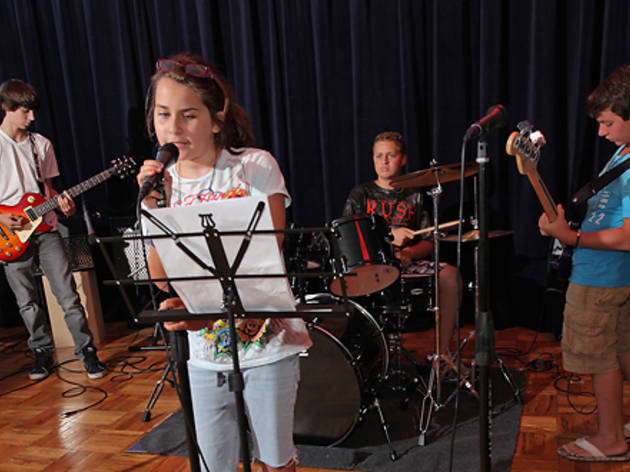 Instrumentalists learn rock, jazz or blues, while aspiring singers hone their skills and listen to the results in the school's recording studio. 4 Giffords Ln between Amboy Rd and Brower Ct, Staten Island (718-984-6988, sischoolofrock.com). Ages 5 and up. See them perform: May 15 noon--3pm. Full Cup, 388 Van Duzer St between Beach and Wright Sts, Staten Island. $10. 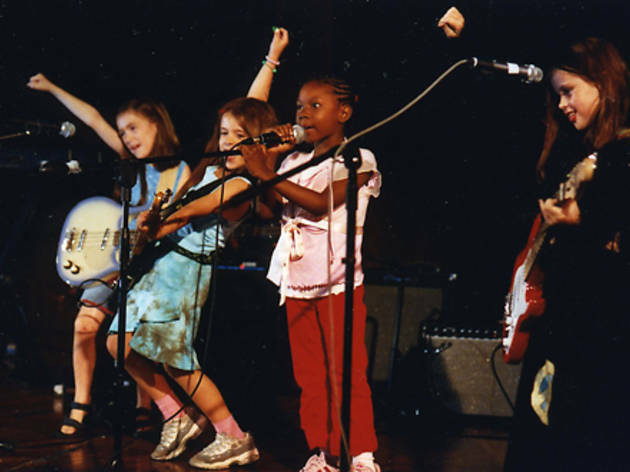 Volunteer female musicians—and visiting artists like the Indigo Girls' Amy Ray—lead kids through instrument instruction (including guitar, drums, vocals and turntables), songwriting collaboration and rehearsals for a showcase. 87 Irving Pl between Fulton St and Putnam Ave, Clinton Hill, Brooklyn (347-599-0716, williemaerockcamp.org). Ages 8 to 18. See them perform: May 26 at 7pm. Willie Mae Music Lab; see above for venue info. Free.